My van has had a water pump leak for about a month. Cannot find exactly where the leak is coming from. Water pump is almost completely behind serpentine belt and under engine block, I can take it off but not put it back together. Money is beyond tight, I cannot afford to replace the water pump ($50.00 plus labor best case scenario) but I refill coolant somewhat regularly (mostly once a week two weeks). Otherwise the van runs perfectly. Is it a waste of money to get a stop leak formula or something similar? Or should I just try not to drive often until I have the cash to replace it? Either way I will have to drive on it, I just want to find the least destructive option. Edit: I get a high pitched squeaking noise when I turn the engine on. It lasts about thirty seconds max and sometimes goes away immediately. It is less intense when the engine is hot or, coolant is full. Maybe water pump, neighbor suggested serpentine belt but I do not have any issues driving and have had a bad serpentine belt in this car and it is obvious, just the squeaking noise is similar/belt-like. Do not use a sealer. None of that stuff works and causes more problems like clogging of the radiator and heater core. 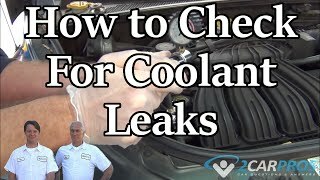 The squealing is most likely the belt from coolant leaking on the belt and it is burning off the coolant. Get the system pressure tested first to be sure it is the water pump. It may turn out to be something more simple for you.